The Village Voice's Brooklyn Pour took place October 6, 2012, celebrating over 100 craft beers brewed in and around New York. 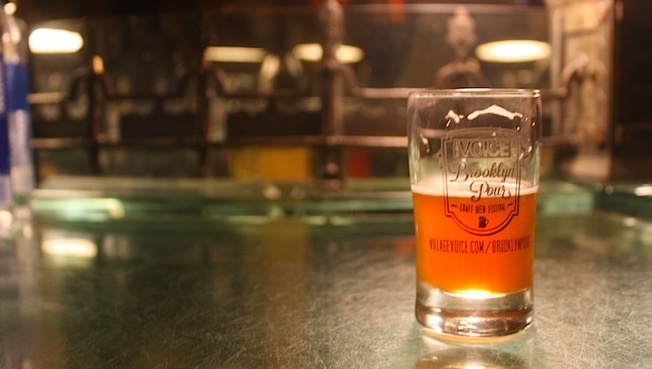 This past Saturday, October 6, beer lovers gathered at The Village Voice's Brooklyn Pour event in Fort Greene, Brooklyn, for a celebration of over 100 craft beers from all over the country, with a heavy emphasis on New York brews. Some local favorites included Blue Point Brewing Company, Ommegang, Brooklyn Brewery, Captain Lawrence, and Sixpoint Brewery. But one of the best parts of the event was discovering some local beers that we weren't too familiar with that are brewed right here in New York City, such as The Bronx Brewery from The Bronx (serving a Bronx Pale Ale and Bronx Rye Pale Ale), Harlem Brewing Company of Harlem (serving Sugar Hill Golden Ale) and Chelsea Brewing Company of Chelsea (with Chelsea Pumpkin Pie and Checker Cab Blonde Ale). It's easy to forget about some of your smaller local breweries in a city where pretty much any beer is readily accessible. The nicest and most refreshing surprise came from Ithaca Beer Company of Ithaca, NY, with their Ithaca Apricot Wheat beer. Upon reaching the table, I prefaced the beermonger's 30-second sell with, "I usually don't prefer wheat beers." Despite the subtle and unintentional snub, the nice gentleman offered me a small tasting of what later became my favorite beer of the night, which had me going back for a second (and bigger) pour… with a major apology ready. The sweet fragrance and apricot hints were both delightful and refreshing. Consider me a wheat beer convert. Another winner goes to Kelso Beer Co., whose beer guy definitely had the best beer descriptors of the night, offering the Kelso Rye Porter (described as the type of beer where you end up on the tour bus with the band after the show) and the Kelso Kellerfest (described as more of a toned-down "first date" beer). For someone who enjoys a wide range of beers, but definitely can't be classified as a beer connoisseur, I thoroughly enjoyed both Kelso selections… but, leaned slightly towards the more robust, and wild, Rye Porter. I'll get on that tour bus… hey, why not? For a full list of beers served, visit VillageVoice.com.